Why you should build wireframes in Powerpoint. There are dozens of tools for building user interfaces, some of them are web-based, some require specialized skills and software (looking at you Adobe). They all have their place, but I routinely recommend people user Powerpoint for their wireframing needs. It allows you to quickly get feedback from real humans before a single line of code is written. For clarity: I'm going to say Powerpoint for the remainder of this post -- but Powerpoint, Keynote, LibreOffice, Google Slides are all acceptable alternatives. I train my teams to use the simplest/fastest prototype or tool that gets them the feedback they need to advance the product down the development pipeline. The best tools are the ones that reduce friction and allow you to increase your development velocity. If you have to learn a new UI in order to implement a test, you’re reducing your speed to market. That amount of friction may seem small, but it adds up. Experienced product managers will tell you that more deadlines are missed as the results of hundreds of small inefficiencies than one-off catastrophic events. More powerful tools have more features, more feature means more complexity and time wasted on irrelevant details. You shouldn’t be concerned about anything but information architecture and block level elements when wireframing. As a simple guideline: When you’re building a wireframe, it should be no more complicated then what you can personally draw on a whiteboard. So in practice, you should be creating the digital version of your crappy illustration. This is important, because design should be left to designers. The purpose of a wireframe is to identify the functional units on a page (and maybe their relative priority/weight). Primarily, you should be concerned with content at the “block” level. Instead of worrying about design, you should be asking yourself if all of the objectives of the page/view are being met. It sounds trivial, but I can’t tell you how many e-commerce wireframes I’ve reviewed that didn’t have contact information in the headers or navigation, and/or didn’t provide a direct link to the cart page. Every page should have one job, make sure that you have the content blocks that support the page’s goal. You friends, family, business analysts, content marketers, and pilot customers, all know Powerpoint well enough to wireframe. They are the Subject Matter Experts on their needs, not your designers. You wouldn’t ask your Plumber to architect your home, so why would you ask a Web Developer to determine your information architecture? Getting the right team members engaged with the wireframing process will improve the quality of the output. Wireframes are the foundation that your product’s usability is based on. This part of the design phase is also the cheapest, and fastest place to make changes based on user feedback. No one has spent hours in photoshop, no one has written a line of code, there are no dependencies – enjoy this agility while it lasts and try wireframing different variations of your screens. You can emulate interactions with your product by building different slides to represent different states. By having clickable areas load specific slides, the wireframes can show a user the result of their actions. This functionality allows you to test different funnels and begin to understand how novice users interact with your product. The biggest benefit of this entire process is that, you can perform interactive user testing without engaging a designer or software developer. Powerpoint is ubiquitous, you can share files and get quick revisions from several stakeholders remotely and asynchronously. Additionally, you can export the final product as a PDF for easy user testing. Load that PDF on your mobile device and ask random people at a coffee shop to accomplish a task on your site, BOOM!, observable user testing for the cost of a cup of coffee. What other tools have you used to quickly build prototypes? What were the benefits and drawbacks? Author Clark DeverPosted on March 5, 2019 March 5, 2019 Categories Research & Development, ToolsLeave a comment on Why you should build wireframes in Powerpoint. Why do Navy SEAL candidates quit BUD/S? In Episode 3 of “Cleared Hot”, Andy Stumpf talks about his time as a Basic Underwater Demolition School (BUD/S) instructor. According to Wikipedia, “BUD/S is a 24-week training challenge that develops the SEAL candidates’ mental and physical stamina…” and according to Andy, one of the instructors’ jobs is to eliminate candidates from the program. Specifically, those who do not have the mental toughness required to be an operator. Andy interviewed many candidates who quit. He wanted to know what lead to their decision, so he could develop techniques to exploit the weakness in others. Their most frequent response was that they were overwhelmed by the duration of BUD/S. They were experiencing discomfort and multiplied it by the time remaining in the course. Psyching themselves out. Successful people focus on breaking down seemingly insurmountable tasks into smaller objectives. Achieving each smaller objectives creates a momentum that allows them to blast through the larger obstacles. Although I’m not a SEAL and never will be. I’ve personally experienced this in Marathon Training, Weight Lifting, and Entrepreneurship. The first mile, squat, and pitch — those moments felt overwhelming because I knew how tiny my current output was compared to the end goal. But each day I put in the work. I focused on following the plan and completing today’s objectives, not worrying about the end state. When the time came to complete the mission I had been training for, my body and my mind were ready. Show up, do the work, rest, repeat. What’s the largest goal you’ve succeeded at? How did you break it down into smaller pieces that you could accomplish? What in your life today is stressing you? What’s the next incremental step towards fixing it? Author Clark DeverPosted on February 28, 2019 February 28, 2019 Categories Self-Improvement, UncategorizedLeave a comment on Why do Navy SEAL candidates quit BUD/S? How do you leave Social Media without losing your network? I’ve spent the last six months weaning off of Facebook’s suite of apps. Their lack of ethics finally outweighed the value of their ubiquity. Because of this, I began the process of deletion (Facebook, Instagram, Messenger). Almost immediately, I felt a notable change in my overall level of happiness and contentment. Trending topics and outrage focused feeds may have been overloading my psyche. My brain is only able to effectively deal with the level of stress generated by the happenings of a small community (See: Dunbar’s Number). I was genuinely surprised by how much better I’ve felt once I removed awareness of the continuous-crisis news-cycle from my life. The major downside that originally kept me from leaving was FOMO. I didn’t want to miss out on dank memes and interesting dialogue. To counter this perceived loss, I’ve decided to start generating more original content and I’m working to develop deeper relationships with key individuals in my life. There are plenty of posts on how to backup Facebook and Twitter data and deactivate your accounts. So I’m not going to cover Step 1 and 2. I decided to switch my primary messaging client over to Signal since it supports end-to-end encryption, is easy-to-use, and is cross-platform. It also supported encrypted phone calls. The only thing that I’ll miss is the video conferencing – which I plan to handle through Google Hangouts or Skype. I now block time using recurring appointments to make phone calls to key friends/family and to blog. I will be distributing my blog via mailing-list and I plan to put hooks into each post to start 1-to-1 conversations. By disintermediating my relationships, I hope that I can build a stronger network that involves more personal and meaningful interactions. How do you feel about your social media usage? On average do you think it makes you happier and more content or does it leave you with feelings of insecurity and anxiety? What’s keeping you from disconnecting from the major platforms? Author Clark DeverPosted on February 27, 2019 February 28, 2019 Categories UncategorizedLeave a comment on How do you leave Social Media without losing your network? Faster more relevant blog posts PostHaste! What if you could assemble high performing blog posts in just a few moments? What if this content you create would also tap into a larger conversation automatically, piggy-backing off of interest in current issues in the news? What if you could do all of this in just a couple of minutes? Now you can, with Posthaste. Author Clark DeverPosted on May 8, 2018 May 8, 2018 Categories Uncategorized1 Comment on Faster more relevant blog posts PostHaste! Every year, I try and participate in at least one Hackathon. As a Product Manager, I find building and shipping a product as fast as possible is a great way to work on your ability to scope and prioritize features. 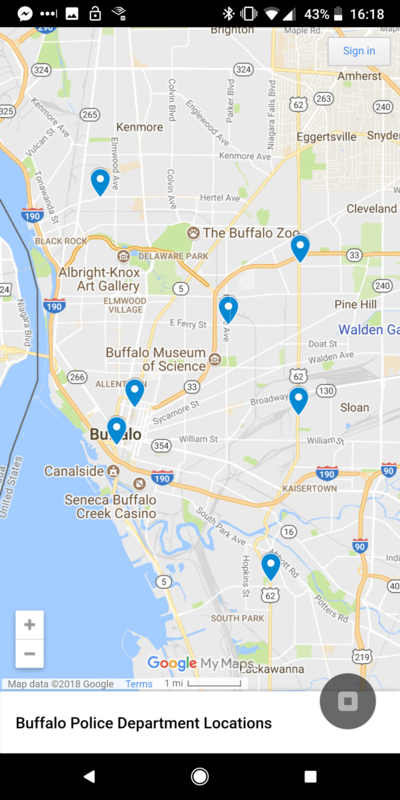 This year’s hackathon was Buffalo’s Civic Innovation Challenge. Which consisted of building an Android App called “Good Neighbor” utilizing Open Data from the City of Buffalo. The other benefits of Hackathons is the challenge of learning a new tool or language in a low cost setting. I played around with Monaca and Onsen UI 2 while building this app. Monaca’s web based IDEA for HTML5 apps was outstanding, I could make an update and instantly see it’s impact on my devices running their Android Debugger App. Onsen UI allowed me to quickly utilize their Cordoba modules that translate to Android and iOS native UI elements. I’d recommend both for your mobile prototyping needs. I built the entire Proof of Concept in about 6-12 hours total. If you’re hackathon code would pass a peer code review, you probably didn’t push yourself far enough into uncharted territory. With Good Neighbor, we wanted to create a multi-lingual app targeted at new immigrants and refugees to the City of Buffalo. 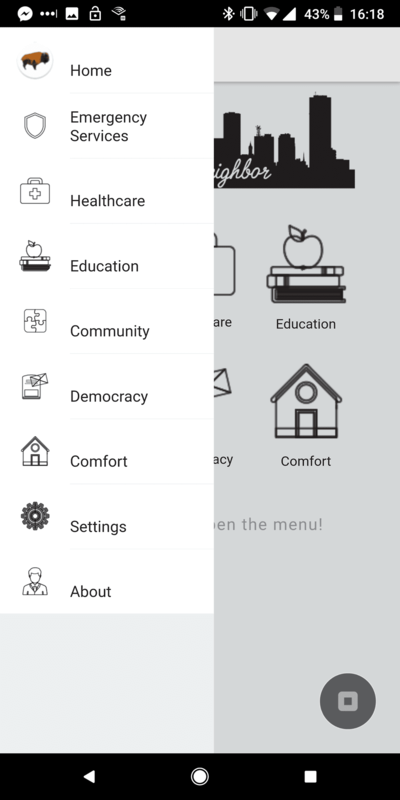 The app acts as a portal in their native language, provide curated links and maps to essential civic services. A tappable home screen with easy to identify iconography. 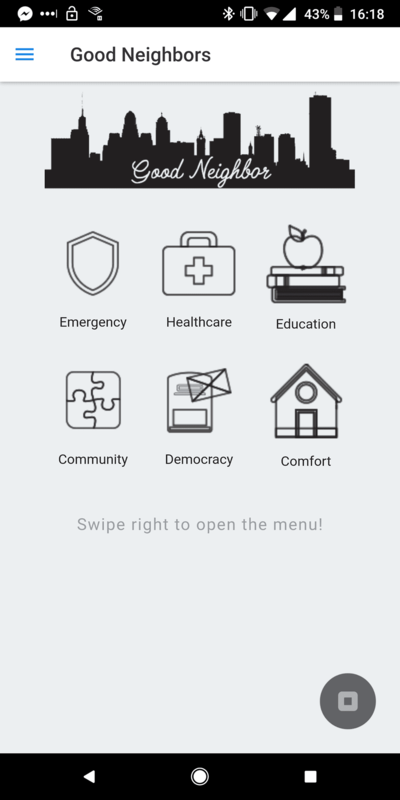 A swipeable/tappable menu that uses the same iconography to provide navigation assistance from all views. On the user facing side, we ended up having to bail on the integration with google translate. It would have been an awesome feature, but we decided that there was more value in adding more content to flesh out the app for the English speaking judges. On the technical side, we didn’t get to refactoring the app into multiple files, due to a fear that Angular.js might barf and we’d lose a ton of time on a technical “nice-to-have”. A trade-off we weren’t willing to accept for time that we could have been spending on building out content. Hackathons breed hacky code, but that’s the point. They reinforce the “Ship It!” mentality. Micro-contracts are one-line agreement with yourself. They are used to short-circuit decision making process for recurring events. The goal is to increase compliance with habits you’re trying to install in your life. A micro-contract is the building block for a habit. If <recurring decision point>, I will do <behavior>, so that I <reason> . e.g.) If I am going to eat out, I will eat the healthiest option on the menu (or default to a salad with dressing on the side), so that I can live a long and healthy life for my family. The way that I’m currently programming them into my life is by adding them to my lock screen on my phone. According to the app, “Quality Time”, I average around 100-120 unlocks a day. That’s a lot of reinforcement to internalize my current micro-contracts. If you’re not as heavy of a phone users, you can reinforce your micro-contracts by hanging them next to the mirror in your bathroom or setting your desktop wallpaper to your current list. Why should you use Micro Contracts? Research shows it takes up to 90 days to instill a new habit. For comparison, this is about as long as it takes to close on a house. Which is the largest, longest, and most complex business deal most people will participate in during their life. When I’m teaching sales to people, I reinforce the mantra “Old deals die.”, meaning that if you don’t close the deal quickly, something will go sideways and the deal will fall apart. If “Old Deals Die”, how can we keep them young? By focusing on action. In sales, we follow up and keep the process moving. Checking in with the decision maker, answering questions they have, and educating them on the process. In our home life, we can revisit our goals daily or weekly, evaluate what’s working and take action on the things that are putting the behavior at risk. For instance, How many times have you started going to the gym regularly for a few weeks only to miss twice due to work or travel? What happens next? You fall completely out of the routine and it takes months to get back to it. It’s happened to me dozens of times. In quality management circles, we’d refer to this recurring problem as a “failure mode”. We’d document it as a risk and determine an approach to mitigate the impact on the project. In our gym example, we’ve documented the failure mode of “Missing Twice”. Now we need to put a control in place to stop it from happening. A control is a guideline that we use to evaluate an occurrence of an event and instantiate a corrective action if it falls outside the desired range. This sounds like the perfect place create a micro-contract or two. Let’s look at two variants, an affirmative micro-contract and a negative micro-contract. The affirmative micro-contract should reinforce the “why” for doing the behavior you’re trying to install. It’s the “carrot” method of coercion. The negative micro-contract should be the “stick” that escalates the stakes in order to bring yourself back into compliance with the habit when you’ve gone out of control. If I missed the gym today, I will go to the gym first thing in the morning, so that I continue to improve my health and maintain my mental wellness. If I missed the gym two times in a row, I will not <do my favorite thing> until I go to the gym, so that I don’t break my habit, get fat, and become depressed. My current approach is to add a new micro-contract or two to my life each week. I use them to reinforce the current habit I’m building. I try to only install or uninstall only one habit at a time, I make them quarterly goals so that they have the full 90 days to become entrenched. My hope is that by adding micro-contracts each week, I will be able to increase my success rate for forming habits. These simple statements will help me to control for failure modes and encourage me to refocus on my goals weekly. Do you have any ideas that could improve micro contracts? Where do you think they would provide value in your life? Let me know in the comments below.